D’Evereux, Natchez – (c. 1835-1840) (National Register). While HABS records state that D’Evereux was completed in 1840 for William St. John Elliot, records from the Andrew Brown sawmill in Natchez document that construction was already underway in 1836. The architects and builders are unknown except for signatures in the attic of Ohioan P. H. Hardy and Virginian William Ledbetter. 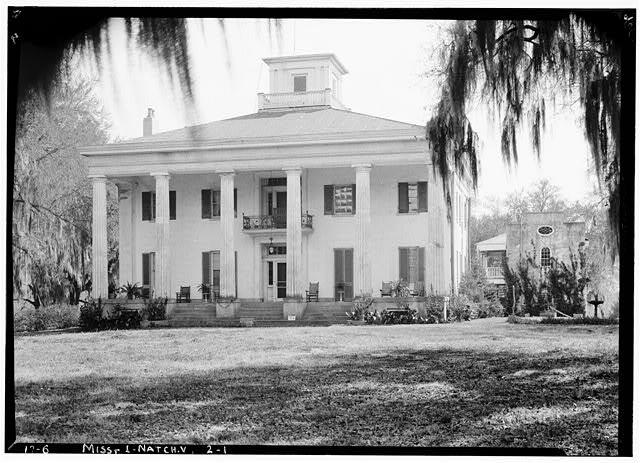 D’Evereux is one of the first residential structure constructed in Natchez with a full-length monumental, two story portico; the white columned look that would be stereotyped as southern architecture in later years. D’Evereux also marks the first appearance of a cupola in Natchez residential architecture. Although some changes have occurred to the interior, it is still generally original and intact. According to the National Register nomination form, “Perfection of proportion and academic rendering of its structural and decorative detail make D’Evereux one of the outstanding examples of the Greek Revival style.” The Sourcebook of American Architecture names D’Evereux as one of only four “must see” Mississippi buildings. Suzassippi on Happy Easter 2019 A.D.
Beth on Where’s the Fire? Lisa on Where’s the Fire? Suzassippi on Where’s the Fire? Thomas Rosell on Where’s the Fire?